In this episode, Ray is excited to be joined by Dr. Lee C. Camp for a discussion about his book Who Is My Enemy?, and the power of nonviolence to act as an apologetic for Jesus as the Messiah. Join us as we talk about double vision, the politics of Jesus, and the idolatrous nature of the nation-state. Lee shares with us some great historical insights into the teachings of the early Church regarding nonviolence, and how the nation-state has lulled us into an idolatrous relationship in which we give our allegiance to Caesar. 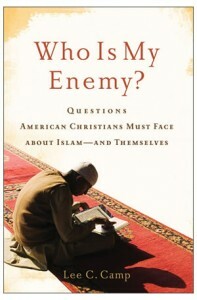 Make sure to check out both of Lee’s books Mere Discipleship, and Who Is My Enemy?, and visit leeccamp.com. Also, if you are going to be in the Nashville or middle Tennessee area make sure to check out Lee’s theological variety show, Tokens. Thanks Lee for joining us for this very helpful conversation!